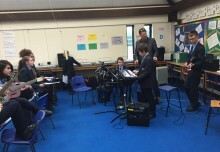 Music plays an important role in daily life at Morpeth School, with all pupils being encouraged to participate in music-making and fostering musical ability at the highest level. 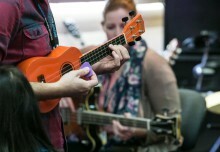 With performance bands, an orchestra, chamber groups, rock bands, choirs, numerous music projects with outside agencies and more than 12 specialist music staff, the Music Department is one of the busiest and liveliest in the borough of Tower Hamlets. Musical Futures has played an important role in how we approach music education and is something that we have been involved in for the past 10 years or so. 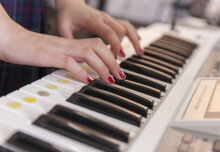 Our change in approach has seen a rise in numbers of students learning instruments outside the classroom and a strong link between what happens in the class and at home. Fostering a passion for learning through music and raising aspirations is something that we have been able to do through informal learning and linking with outside agencies including Guildhall School of Music and Drama, Barbican Creative Learning, DRUMWORKS, SERIOUS, THAMES (Tower Hamlets Arts and Music Education Service) CM Sounds, local primary schools and the Institute of Education. 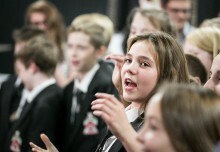 As a Musical Futures Champion School, we welcome visitors and believe in the importance of teaching music musically.